Cranwich is a fairly small parish in the south west of Norfolk, immediately to the north of the border parish of Weeting with Broomhill. Its southern part, Cranwich Heath, is mainly forested, and settlement has tended to be concentrated north of the A134. Its name comes from the Old English for ‘Cranes’ marshy meadow’. The parish has a long history, and was certainly well established by the time of the Norman Conquest. Among its assets listed in the Domesday Book of 1086 were pigs, cattle, sheep, a mill, a fishery and beehives. The archaeological record for the parish is fairly substantial, and this summary provides just an overview. Selected finds and sites are given, but those wishing to dig a little deeper should refer to the full NHER records. There is evidence of human activity in Cranwich from the earliest times, mainly in the form of flint tools. Palaeolithic flints found include axes (NHER 4948), blades (NHER 4947) and a rare Upper Palaeolithic point (NHER 4952). Further flints from the Mesolithic include scrapers (NHER 4954), an arrowhead (NHER 4962), blades (NHER 24661) and borers (NHER 4956). Finds of flint tools from the Neolithic period are particularly numerous, and include polished axes (NHER 4961, 4965 and 4967), arrowheads (NHER 4957) and knives (NHER 4958). At one site (NHER 4952), some 1276 Neolithic flint tools of every type were found, which may indicate a tool making industry in the parish. Flint was certainly plentiful, and there are three possible flint mining sites (NHER 4997, 4998 and 4999). There is also a possible flint working area (NHER 30751). The finds from these prehistoric periods are not confined to flint tools, and this is very unusual; gravel extraction has recovered various prehistoric items, including a wooden bow (NHER 33289), a mammoth tusk (NHER 33292) and an antler mattock (NHER 33164). As the Neolithic gradually gave way to the Bronze Age, flint was still used (NHER 4963), but increasingly copper alloy became the preferred tool material. Copper alloy artefacts found include a knife blade (NHER 4970), a dagger (NHER 4972), a spearhead (NHER 33289) and axeheads (NHER 13697). Metal working may have been carried out in the area, as two hoards of copper alloy objects (possibly being stored for smelting) have been found (NHER 13697 and 15915). Various fragments of Bronze Age pottery have been recovered, in one case, an entire small vessel (NHER 33163). It is possible that there are some Bronze Age burials, or barrows, for example Robin Hood’s Butte (NHER 15522), and the nearby site of NHER 15523 in the south western part of the parish. However, these have also been interpreted as medieval rabbit warrens. It is not uncommon for the Iron Age to leave little trace of its passing, and it is true to form in Cranwich. 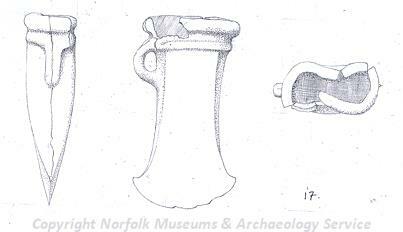 There are several sites where pottery fragments from the period have been found, e.g. (NHER 24530,24531 and 24532), but other finds are limited to a silver coin (NHER 28240) and a spearhead (NHER 33289). There was activity in the parish during the Roman occupation, but the record does not indicate any evidence of buildings or any other type of structure. However, numerous pottery fragments have been found (e.g. NHER 4974 and 13696), and on one site two whole pots were discovered (NHER 31950). Roman coins are also plentiful (e.g. NHER 22024, 24530, 24531 and 25525), as are brooches (e.g. NHER 25479, 33290 and 34480). Other Roman finds include a fragment of lava quern (NHER 13698), a mirror fragment (NHER 23838) and a buckle (NHER 4974). In the Early Saxon period, either land demarcation or defence led to the construction of the Fossditch (NHER 1089), a linear bank and ditch earthwork running north to south between the Rivers Wissey and Little Ouse. It defines the western boundary of the parish, and was probably built to help control a particular territory. Individual finds dateable to Saxon times include pottery fragments (e.g. NHER 13696, 24530, 25525 and 28239), a Late Saxon stirrup mount (NHER 40855) and a Late Saxon silver penny (NHER 39516). The medieval period following the Norman Conquest has left the parish with its oldest surviving building, St Mary’s church (NHER 4976). This charming, isolated thatched church has one of the oldest round towers in the county, probably dating to the 11th century, and having sound holes with knotted tracery. The nave is from the same early period, the chancel being from around 1300, and the north door and south porch 14th century. The larger windows were replaced in the 15th century, but no significant changes have been made since then. Inside, there is a 14th century font and a medieval altar slab relaid as flooring. To the east of St Mary’s lay the village it served. Flint and pottery finds indicate that there had been a settlement in Cranwich village (NHER 1039) more or less continuously from the Iron Age through to the medieval period, but at this time it became deserted (for unknown reasons), and has disappeared. It is possible to make out faint traces of the village from aerial photographs, but nothing remains on the ground. Next to St Mary’s church stands Cranwich Hall (NHER 23510), the former rectory, an early 19th century two storey house with a four window bay façade. Cranwich camp (NHER 25240) was built in the high unemployment period of the 1930s as one of four labour camps in Breckland. Inmates provided labour for forestry work, road building and quarrying. The camp was reused by the military in World War Two, and there are still some Nissen huts standing. Also from the war is a type 22 concrete hexagonal pillbox (NHER 28752), built in about 1940 as part of the anti invasion defences of the time. Pieter Aldridge (NLA), 28 November 2005.